In the frequent hunts of Google in extending their territories all over the World Wide Web with its subsequent ventures of various products and accessories tools in various field out there just beneficiate its users, among many of such the list extends.., recently comes with new website for URL shortener goo.gl, where in its initial release FeedBurner’s Socialize service with integrated the technology , and now their own website goo.gl, the question is - will it affects the world’s popular and Twitter’s apps URL shortener service bit.ly in any way, will Google set a mark in shortening the URL’s? However as most of them using bit.ly and familiar with service it provides in shortening the URls and supports by monitoring traffic details and many more features, popular over web and being the opener for Twitter to be dominant in social networking will resist the competition of Google URL shortener service? appears short URL replacing the long one. Traffic details pop ups, static’s that mentions: how many clicks, viewed locations, metric details, Analysis.., all those will certainly give an idea for the user to their further development of sites. Shorten: when signed in the auto-shorten feature on bit.ly quickly shortens really long links into manageable tractable links. Track: See how many clicks your links are getting in real- time. Referrer, location data and more is easily had by adding "+" to the end of any bit.ly link. Google’s URL shortener service, while its existence nearing almost a year with as a part of Google Toolbar and Feedburner, now own its new website goo.gl for URL shortening, according to Google they opt it to be the stablest, most secure, and fastest URL shortener on the web and it built goo.gl with a focus on quality. 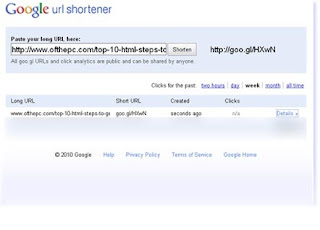 Google URL Shortener assure several things such as stability that is provided by 100% uptime, security and spam detection - protection against malware, phishing and spam using same industry-leading technology in filtering which is used in search, Gmail and other products that geared up its users to a study and speedy reach. Google offers more features and you can scroll or filter the traffic details, let it start from a month wise to minutes wise (least 15) , monitors the details all under one graph. However, when bit.ly has its assets that goo.gl misses now but make over later..? upon such as, not supportive for Twitter accounts and few more as its known Google’s services are always reliable and stable, no doubt, will be a firm competitor to bit.ly and others. Google SEO, the biggie in search engine optimization which pulls the Domain names of various sites to search results pages for promo, will it sustain in URL shortening with goo.gl, Impacting a mark and invades the existing other 100 + URL shorteners that are already out there?